When we’re tired…we slouch forward. 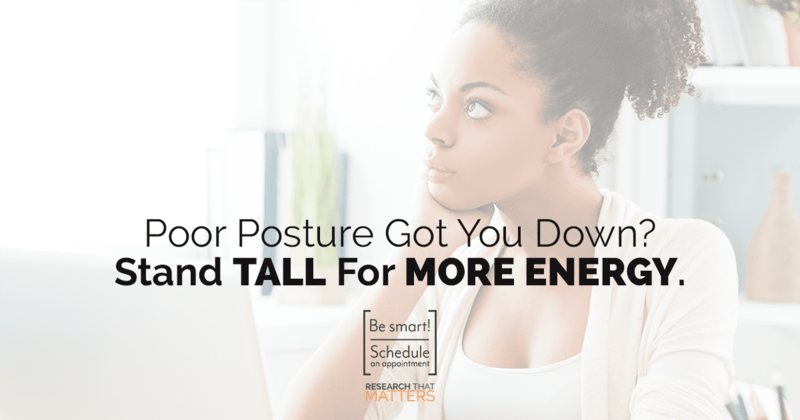 However, new research says that slouching makes us tired and spinal movement gives us more energy. Think of your spinal motion as your brain’s power generator giving you greater energy and clarity. Yes, just by moving your spine you can energize your brain and central nervous system. Research tells us that a Chiropractic adjustment can provide your brain with a natural boost. This is exciting! We already know Chiropractic care reduces pain and makes you feel better, and now we know it also provides a boost of energy. If you’re looking for more than another cup of coffee or bottled shot of energy, great adjustments help you break the vicious cycle! Poor posture can lead to fatigue, pain, and eventually early degenerative changes of your spine and spinal discs. Chiropractic adjustments have been shown to stimulate your brain and musculoskeletal system, reducing fatigue and pain. There are stretches and exercises you can do between adjustments to help keep your spine healthy and happy (JUST ASK DR. SHUMAN!). Health is not a result of how you feel; it’s a byproduct of how you function. Keeping your spine moving and brain functioning at its maximum capacity has been one of the best-kept secrets to getting well and staying well naturally. Stay consistent with your care to stay consistent with your health.